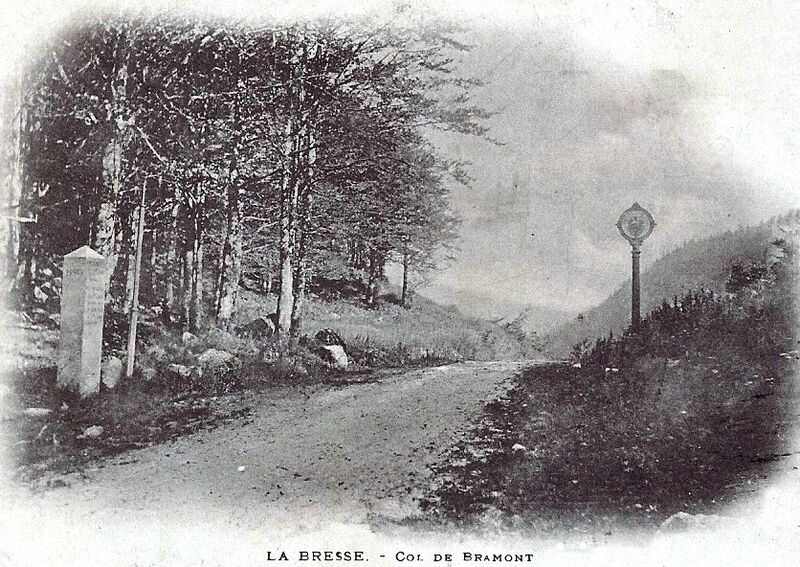 Compared with the bustle and activity in the better known areas of the former frontier, the Col de Bramont and the Col d’Oderen are very still. There is little traffic, mainly occasional cyclists challenging the steep routes on a blazing hot day. The Col d’Oderen (884m) is north of the Col du Bussang on the main route between Ventron and Kruth. Unlike the busy border crossings which benefited from cafés and hotels, this remote Col does not seem to have been particular popular with tourists, though it was patrolled by customs officials watching out for contraband such as matches and tobacco. 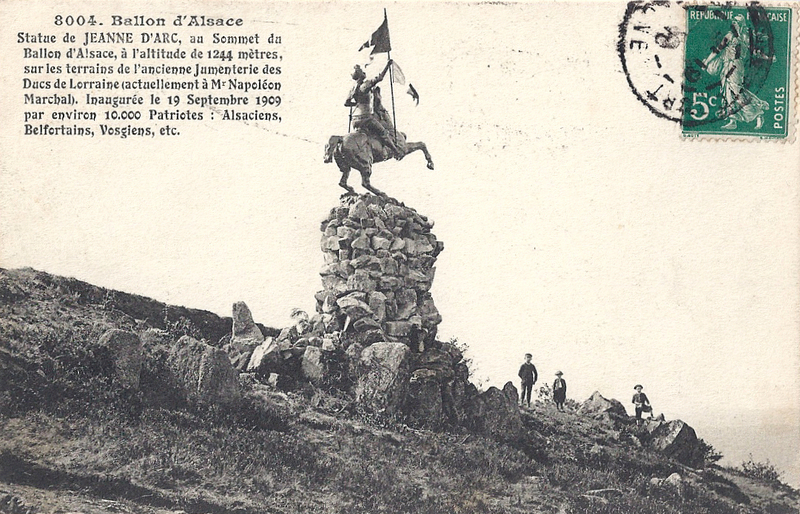 The officers in this postcard are in annexed Alsace , on German territory, standing by the frontier posts of Germany (the round plaque with the Imperial eagle) and France (the adjacent oblong plaque nearer the photographer). My photos were taken on one of those stifling summer days when the tarmac had turned to liquid black stickiness, and leaving an air-conditioned car meant stepping into a daunting blast of heat. A couple of women were peacefully picnicking under the trees. Apart from that, the air was utterly still, gently muddied by the hum of bees and ripped by the raucous cackle of magpies, with the occasional plaintive wails of birds of prey soaring in the thermals. 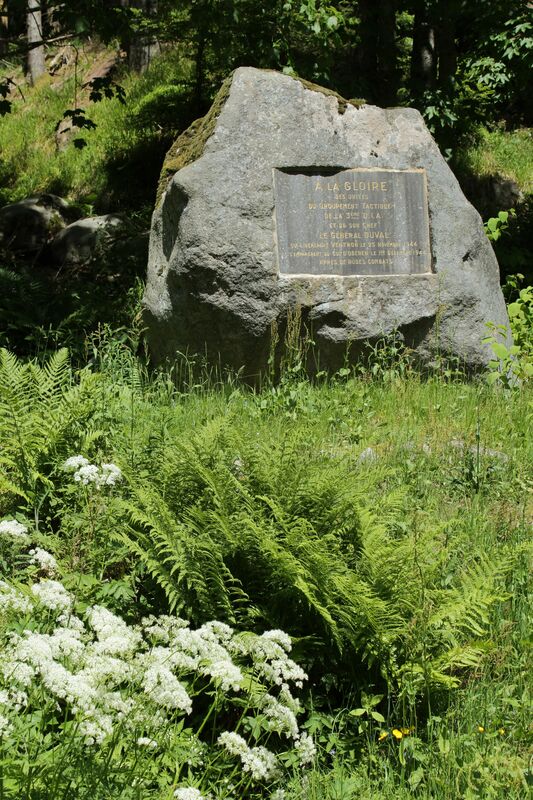 The modern départementale stone is at the site of the ancient frontier, with borne 3102 next to it. This is a Second World War action. 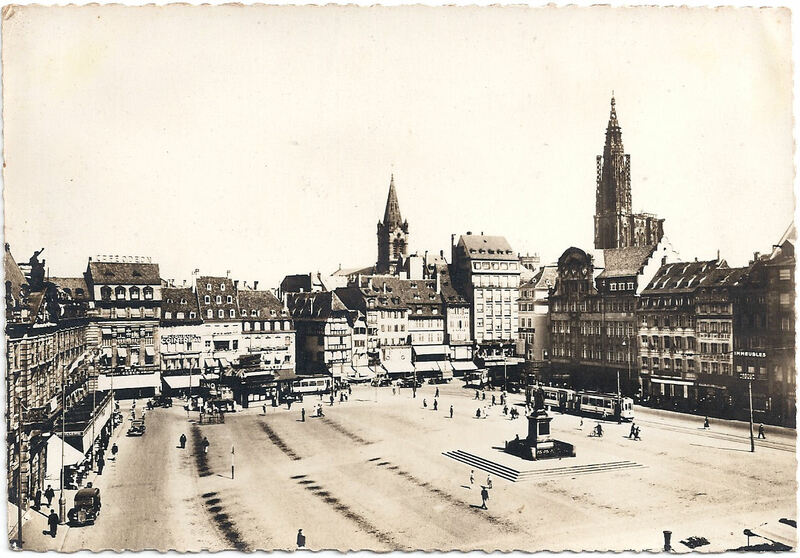 Briefly* : Alsace was again occupied by Germany. 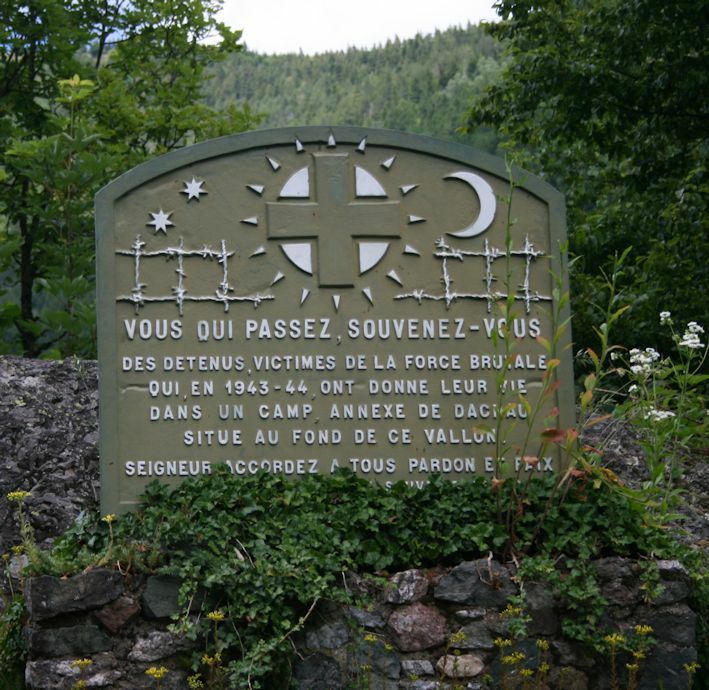 3ème DIA pushed the enemy back from the Gérardmer area through the Vosges cols of Bussang, Oderen and Bramont, liberating various small towns and eventually reaching Colmar, thus playing an important role in facilitating the liberation of Alsace in 1945. It’s worth remembering that Vosges winters are bitter. The icy cold in 1944/5 was unbearably raw. The Col de Bramont (956m) is north of the Col d’Oderen, east of the busy ski resort la Bresse and south of the popular Col de la Schlucht. 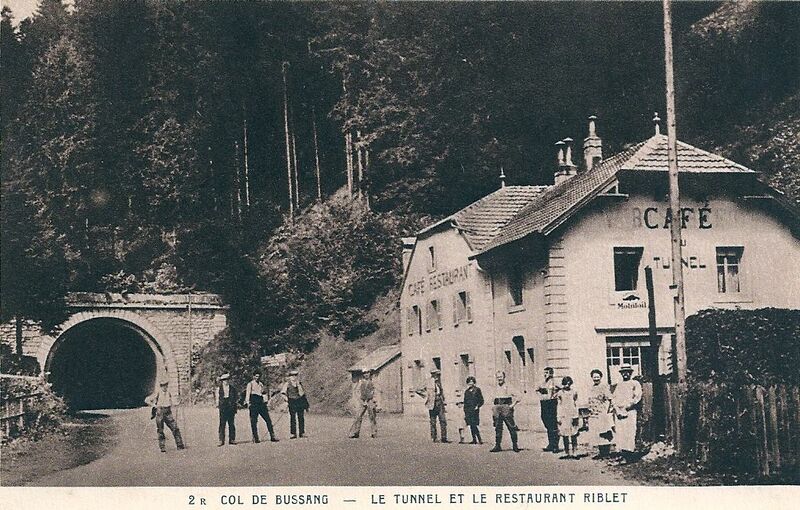 It is one of the wilder of the frontier cols, and in the period when it was actively guarded, there was nothing at all there apart from a small wooden hut which provided shelter for customs officials. Consequently smuggling flourished in the area. 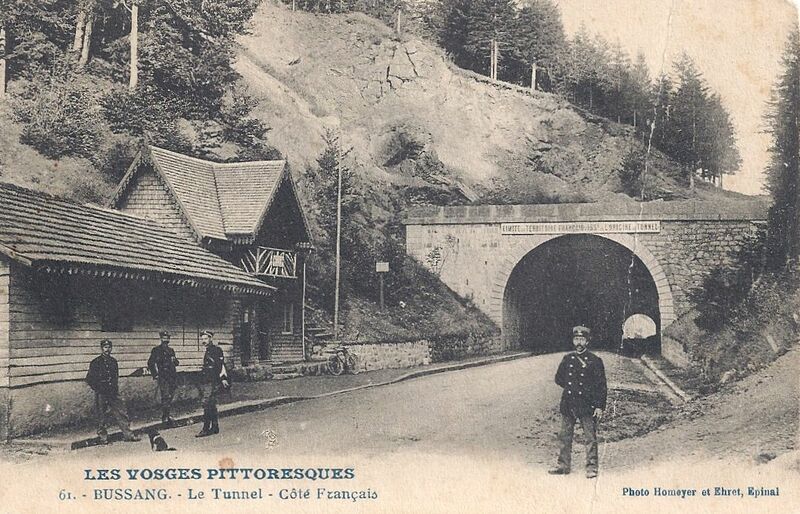 Contemporary postcards reveal a muddy, poorly-formed road, surrounded by ferns and forest. 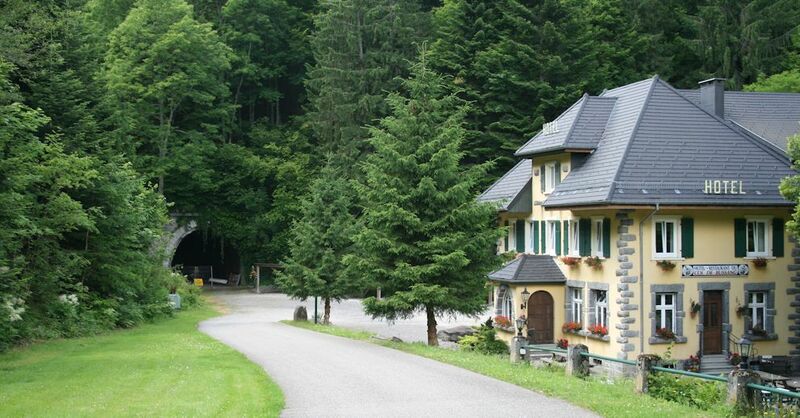 It looks inaccessible and still is fairly difficult in places : the D-road from Wildenstein climbs a series of steep, challenging hairpin bends. 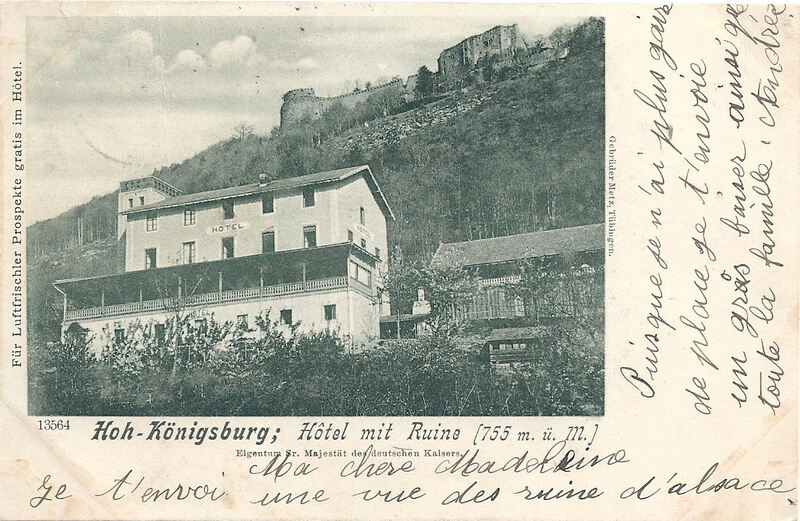 My photograph was taken looking into the former German territory from the former French side and the contemporary postcard shows the same view from the opposite side of the road. 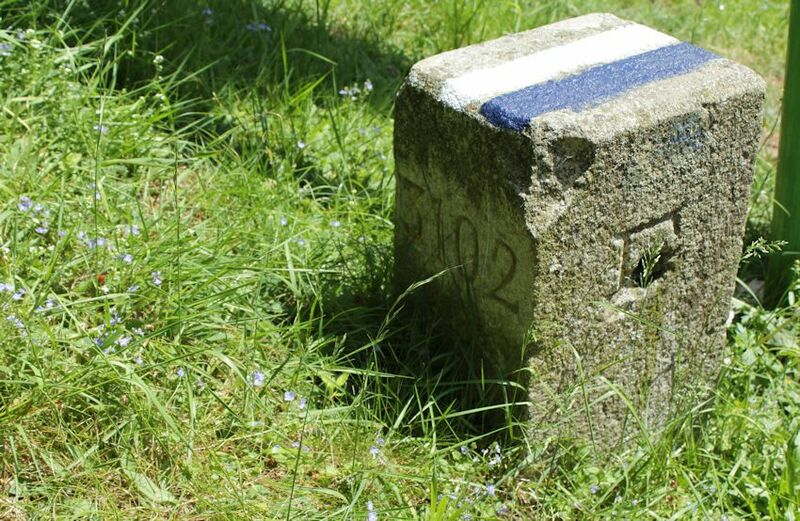 The German frontier post (with the eagle) is approximately where the départementale sign is now. 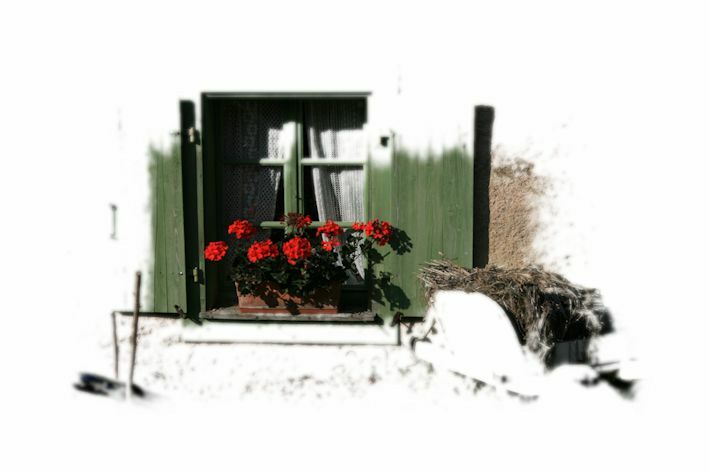 The photographer was probably standing by the douaniers’ hut. 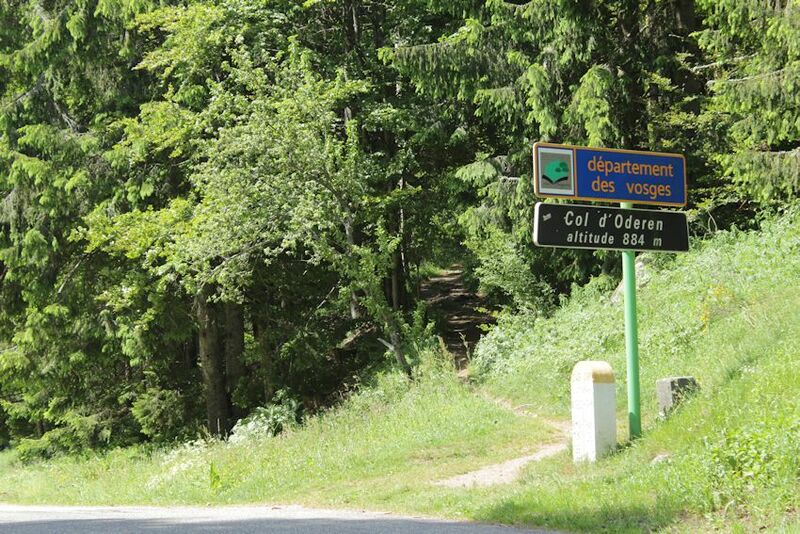 A pleasant drive or walk from the Col de Bramont is to follow the signs to Col de la Vierge and Lac des Corbeaux (via chemin Béry). The pretty lake is in a perfectly formed glacial corrie surrounded by pine forests. 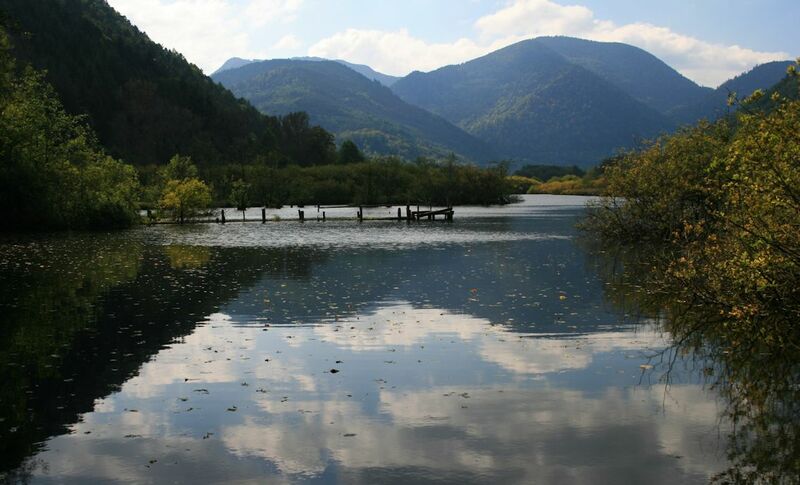 It’s popular for gentle pottering round the lake, strolls along shaded woodland paths, fishing and just relaxing with a picnic. Apparently the water is very cold even in summer – though swimming from the sandy beaches is officially forbidden. However, I suspect that on a future visit, the bathing costumes may well be ready in the car! 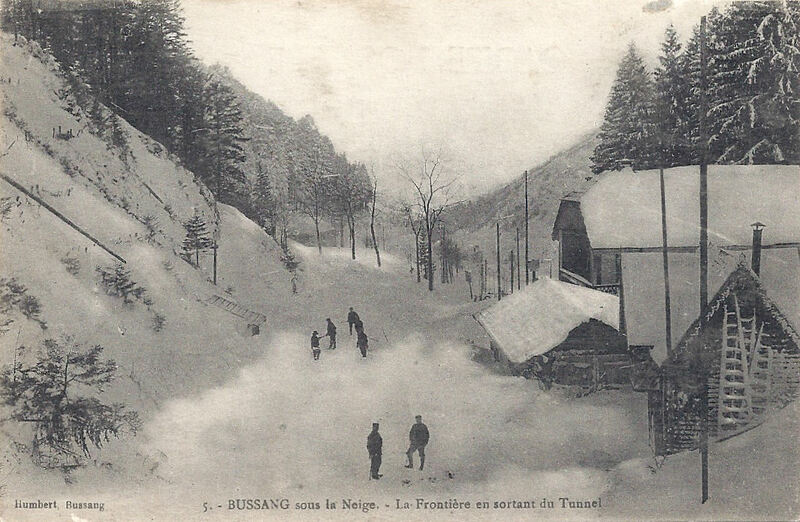 Categories: Administering the frontier before the Great War, The frontier, The Vosges Cols | Tags: Alsace, bornes frontières, Col d'Oderen, Col de Bramont, cols, Elsass Lothringen, frontière, frontier, Vosges | Permalink. 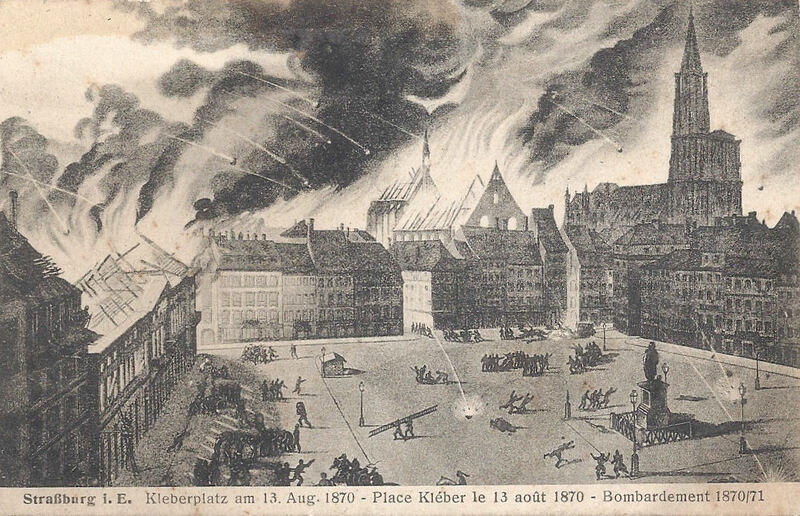 On 30th May 1431 a young peasant girl from Domrémy in the Vosges was burned alive after an illegal trial for heresy in Rouen. 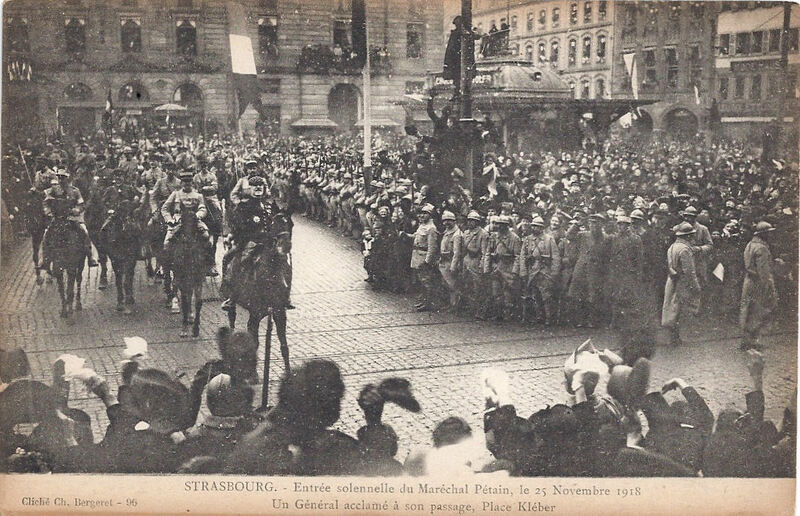 During the period in which Alsace and Lorraine were annexed to the German Empire, she became a powerful symbol of resistance, of defiance, of eagerness for liberation. 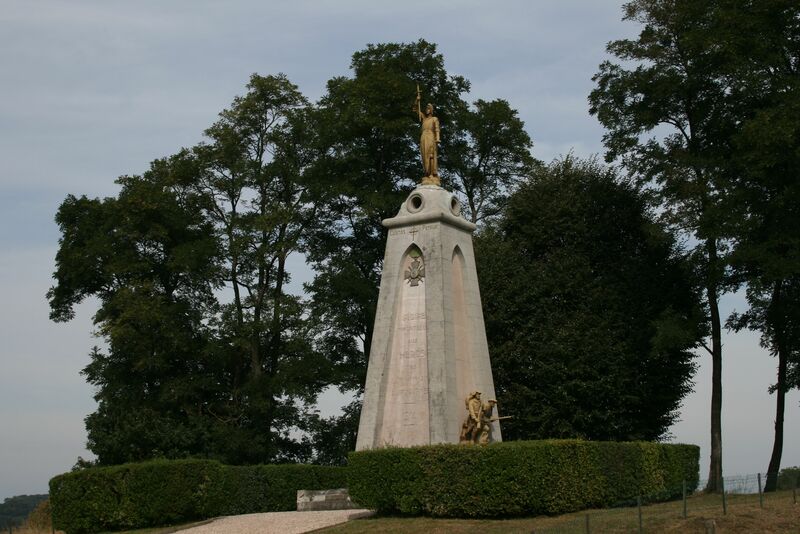 The statue on the Ballon d’Alsace – on the French side of the hated border – of Jeanne d’Arc is still defiantly facing Germany, deliberately positioned to show that Alsace and Lorraine challenge their annexation. 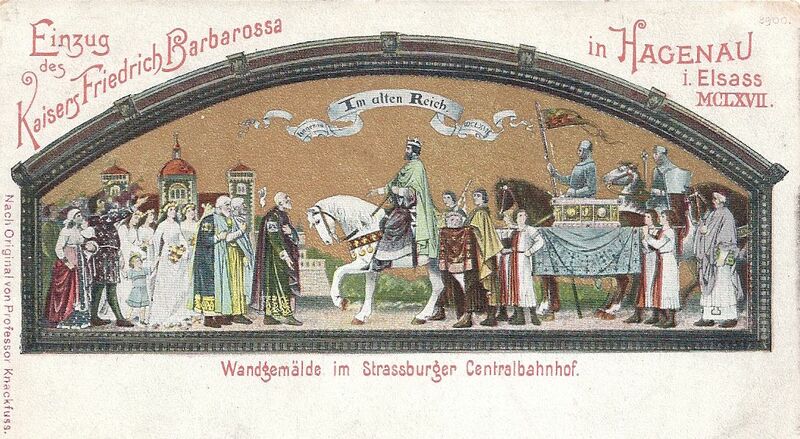 It was sculpted in 1909 by Mathurin and features in many postcards of the era; this one is typical and the text draws attention to the patriotic crowds at the inauguration. 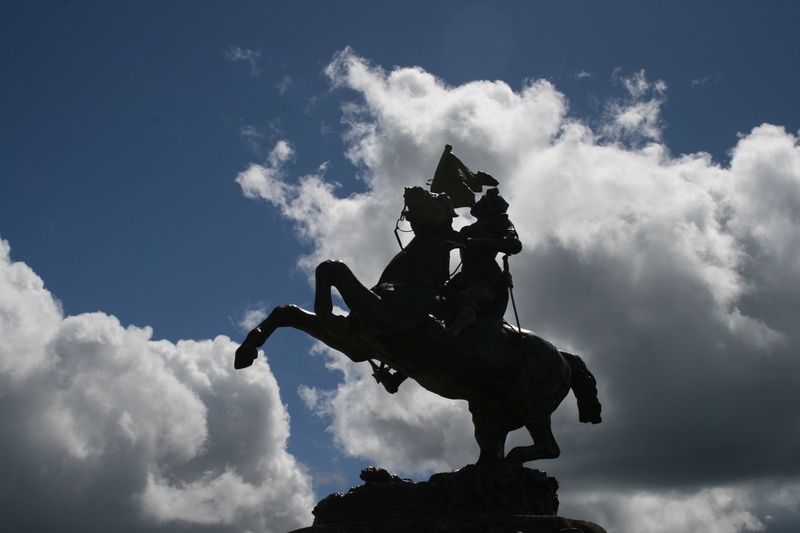 The inspirational figure of Jeanne is a recurrent theme in monuments and memorials after the oppression was lifted. 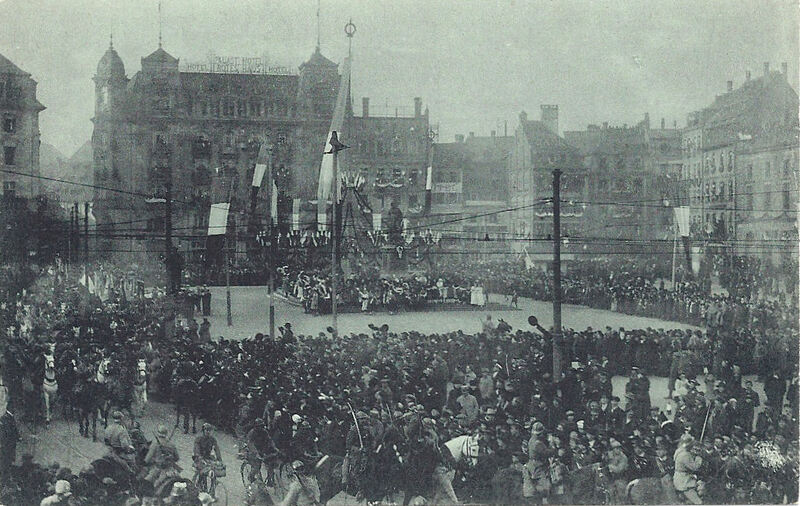 Many Alsacien men were forced to fight for Germany, although it has to be remembered that anyone under the age of 43 when war was declared in 1914 had not known life as a French citizen and many were to all intents and purposes fully fledged Germans. Nevertheless, the theme of a young man being forced to fight for the oppressor is a powerful one and many patriotic images depict the despair of the young soldier and his family. The mother depicted on the war memorial at Guebwiller pins a small rosette on her son’s chest under his jacket and tells him, “Remember you are French.” These rosettes were red, white and blue (the colours of the French flag). 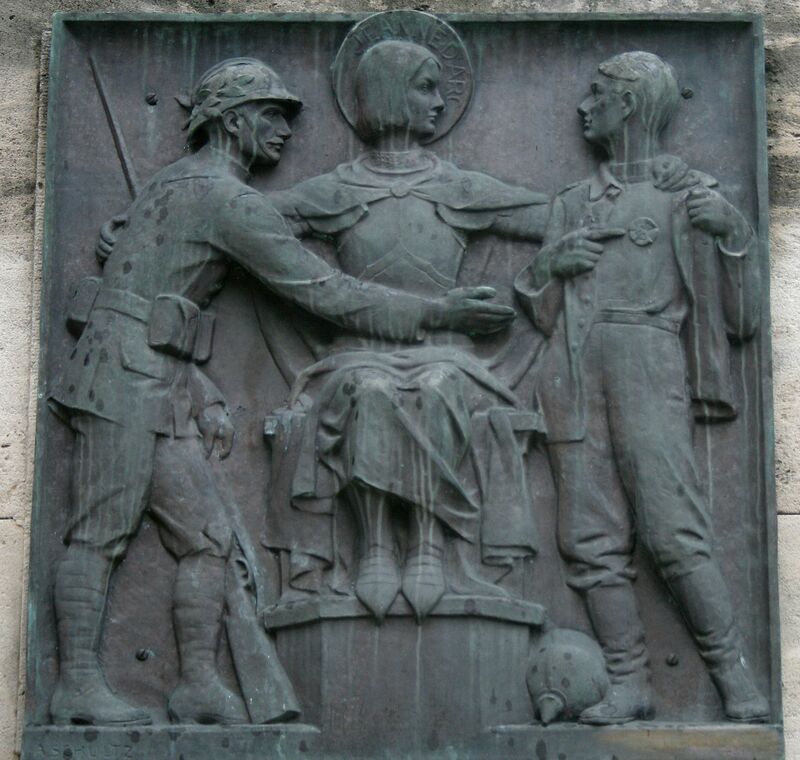 The memorial at Rosheim [below] shows a French poilu offering the open hand of friendship to a young man who has opened his jacket to reveal the patriotic rosette over his heart; his enforced pickelhaube has been discarded at his feet and Jeanne embraces the two in a gesture which emphasises the harmony and unity restored between France and her lost départements. 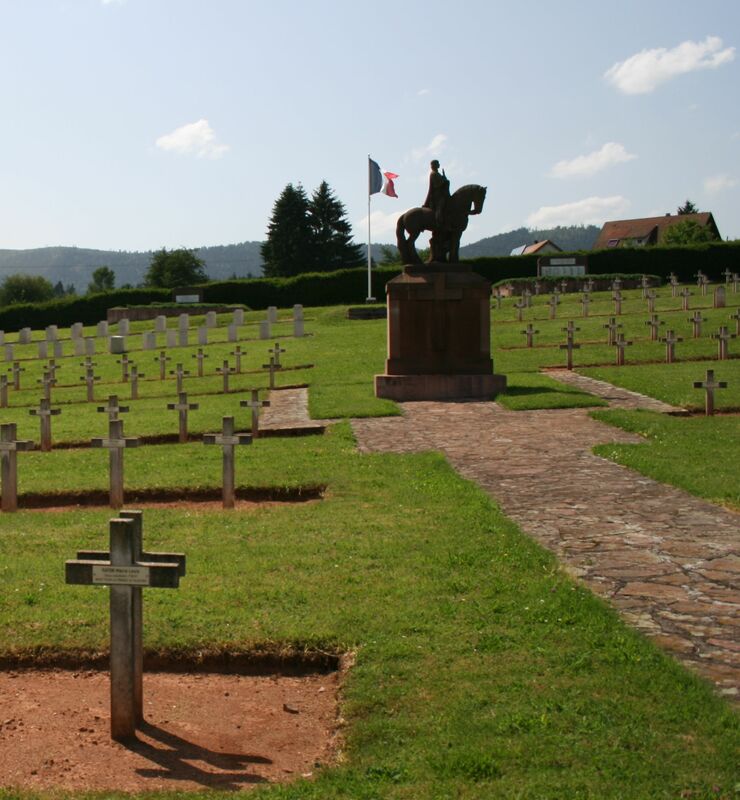 Menil-sur-Belvitte is a large 1917 nécropole nationale south of Baccarat and it is the resting place of a thousand men, many casualties from the Bataille de la Mortagne (1914) and the ghastly fighting at Col de la Chipote. 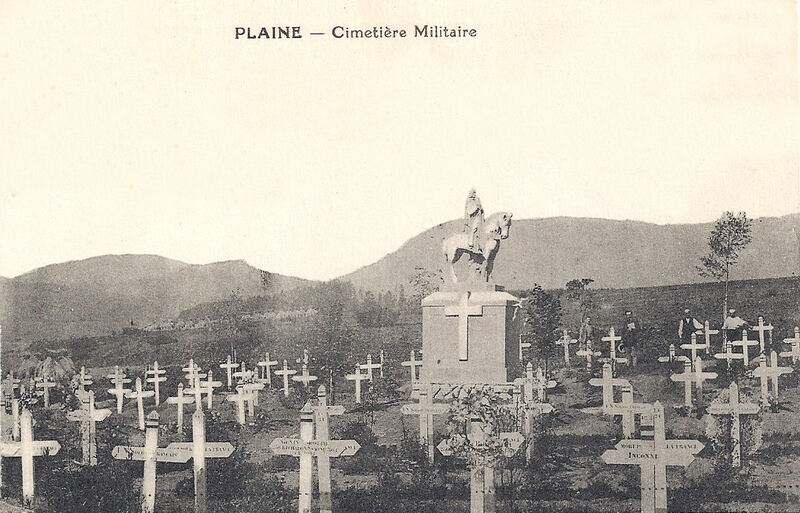 Opposite the cemetery, peacefully surrounded by pastures with the characteristic Vosgienne cows, is a memorial privately erected in 1927 by l’Abbé Collé, the village curé. 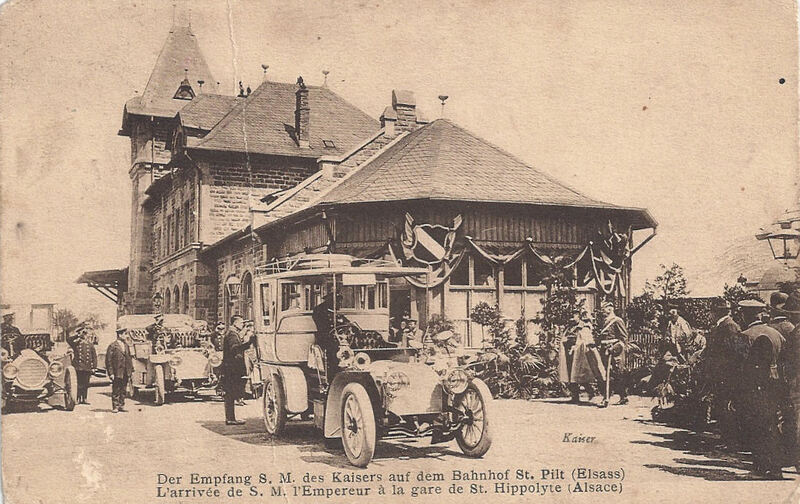 He also established a small commemorative museum which was destroyed by German troops in 1944. 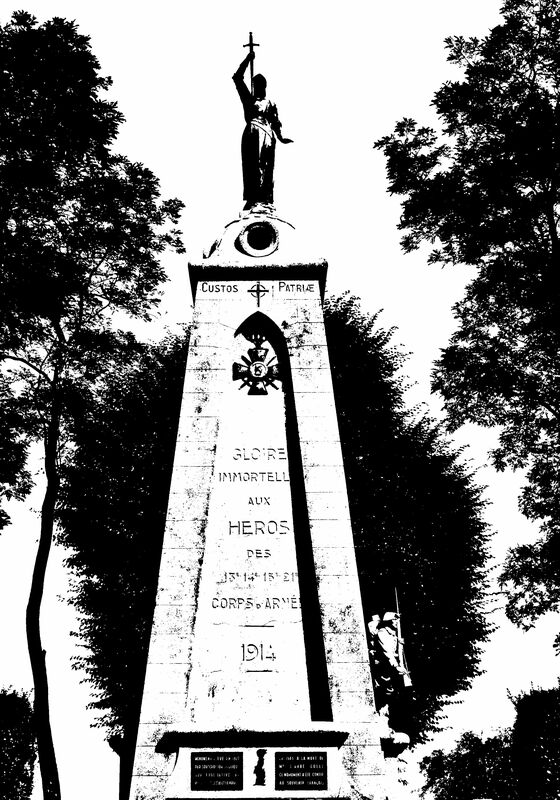 It is a memorial of unexpected height and power; the loyal Chasseur figures, bravely ready for any challenger and in death cared for by a despairing figure of Mary, demand attention. Jeanne’s immense elevation, her raised cruciform sword and her striking gold armour communicate as a symbol of defiance and inner strength even today. Your eye is drawn upwards from the brave soldiers to their alleged inspiration as they fought to regain Alsace and Moselle for France. Note. 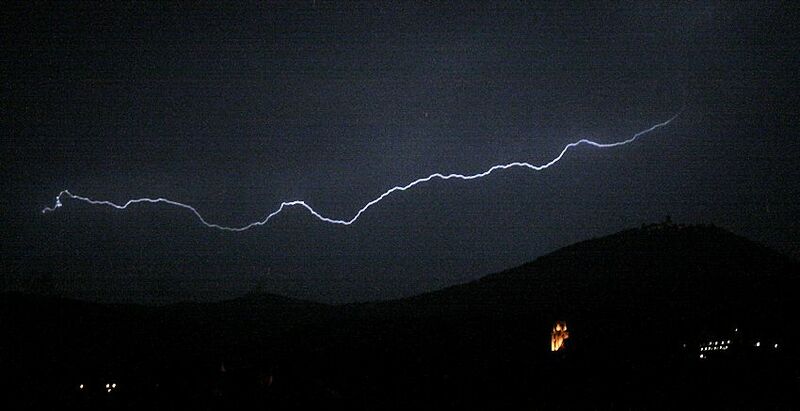 Published to mark the feast day of Ste Jeanne d’Arc, 30th May 2013. 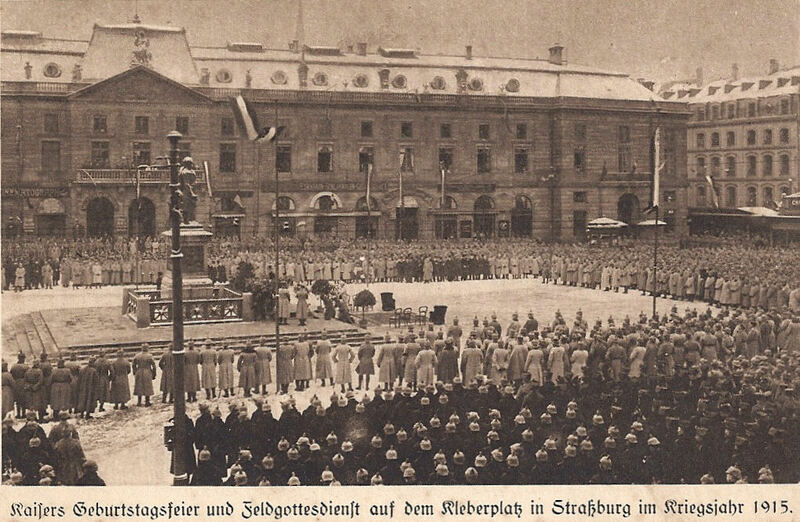 Categories: Royalty, celebrities and personalities, War in the Vosges - 1914-1918 | Tags: Alsace, Ballon d'Alsace, Elsass Lothringen, frontière, Joan of Arc, Menil-sur-Belvitte, Plaine, Reichsland Elsaß Lothringen, Ste Jeanne d'Arc, Vosges | Permalink. 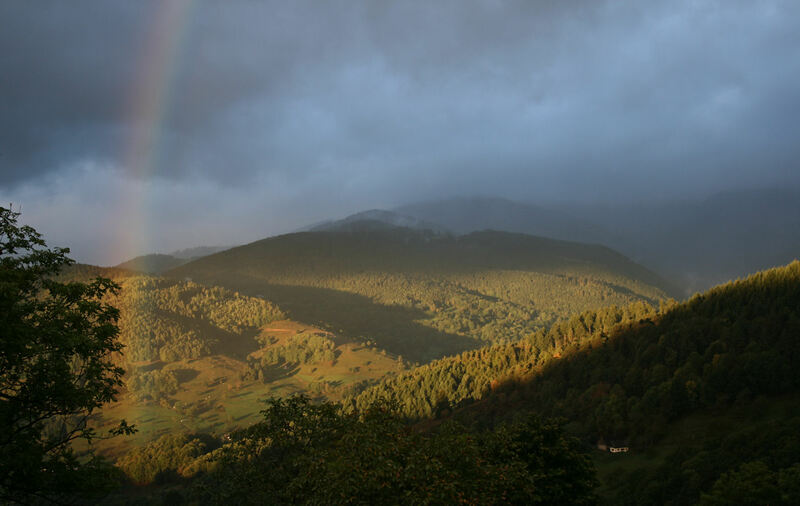 The landcape of the Vosges is mountainous and very beautiful; it forms deceptively rounded peaks rising to a series of summits called les Ballons. 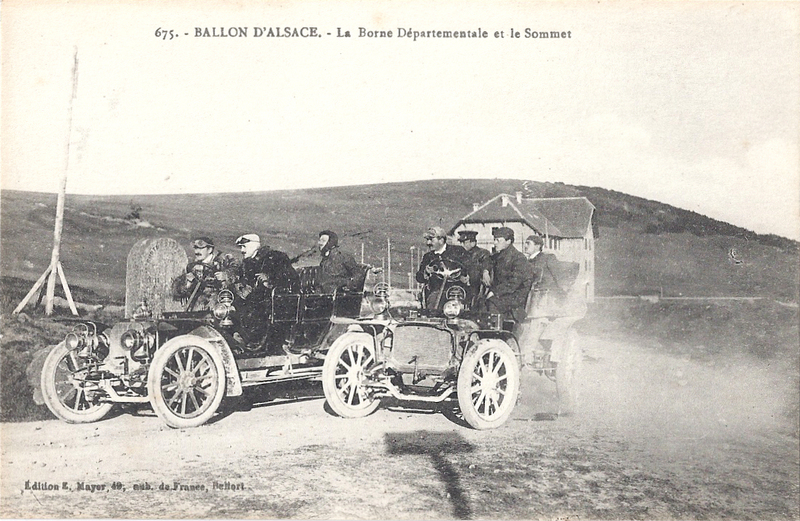 West of Thann, the Ballon d’Alsace is 1247 metres (4091 feet) and the Ballon d’Servance is 1216 metres. The Grand Ballon, west of Guebwiller, is 1424 metres (4672 feet). 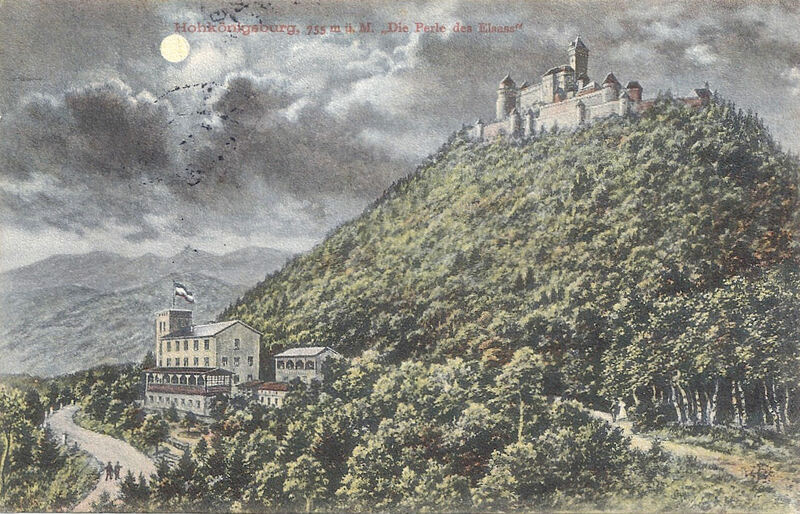 Le Hohneck, west of Munster, is 1363 metres (4472 feet). It’s an exceptional area. 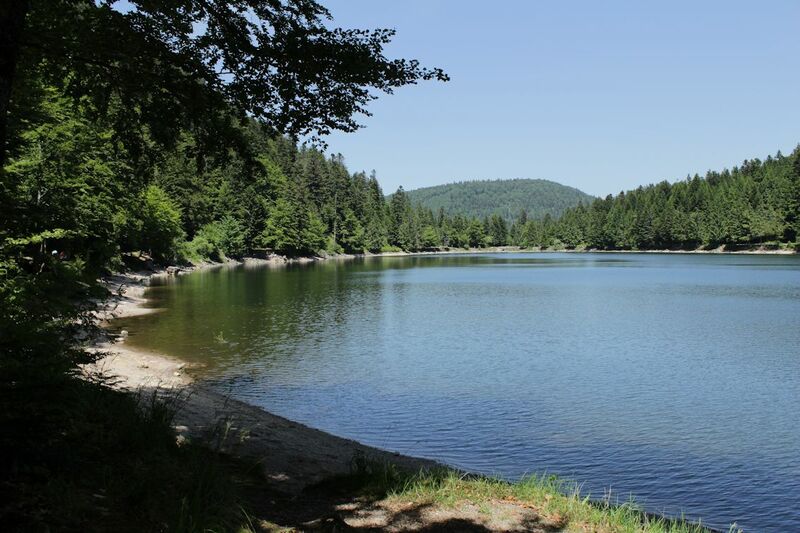 The wild, silent forests with towering pines, still mysterious pools where dragonflies hover in summer, high open pastures of the Hautes Vosges dotted with the distinctive Vosgienne cows, waterfalls, peaty bogs and meadows of mountain flowers are a natural habitat for diverse wildlife. In May, after six months of safe confinement down in the lower farms, humans herd the cows up into the high mountain pastures where they run with their new freedom in a cacophony of hundreds of cow bells: transhumance is a cause for celebration and festivity. 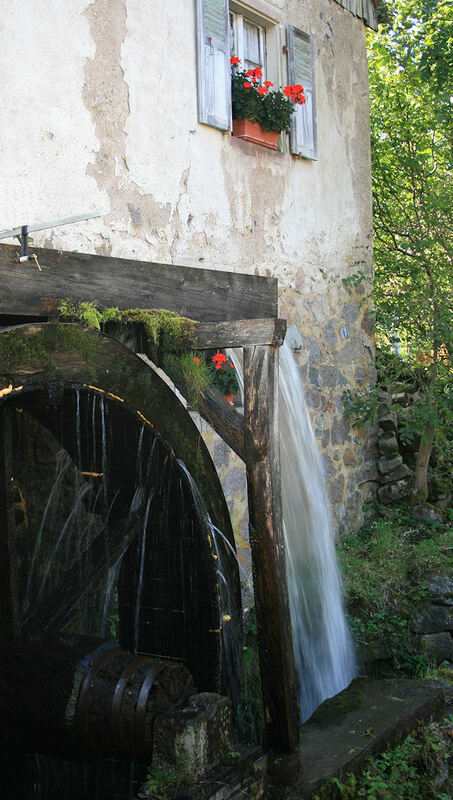 The mountain products are sought after and relished: cheese, hams, honey, kirsch. 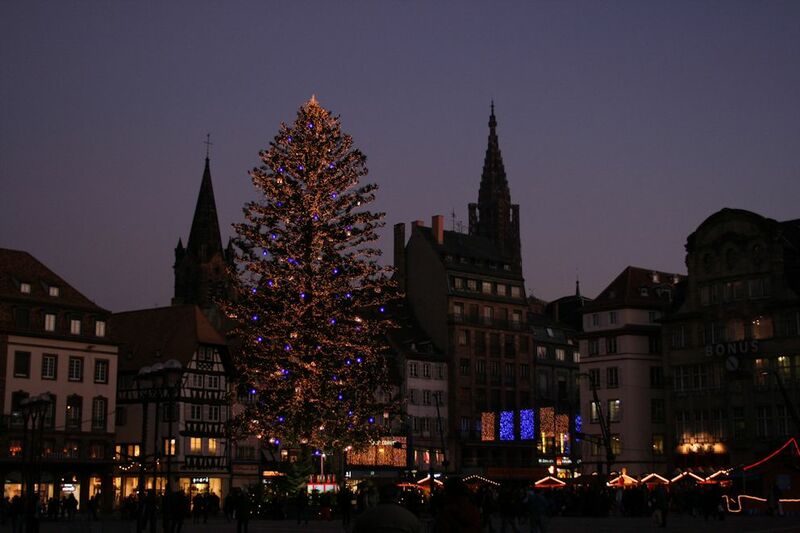 Alsace wine is very special. Biodiversity flourishes even in sites ravaged by war. 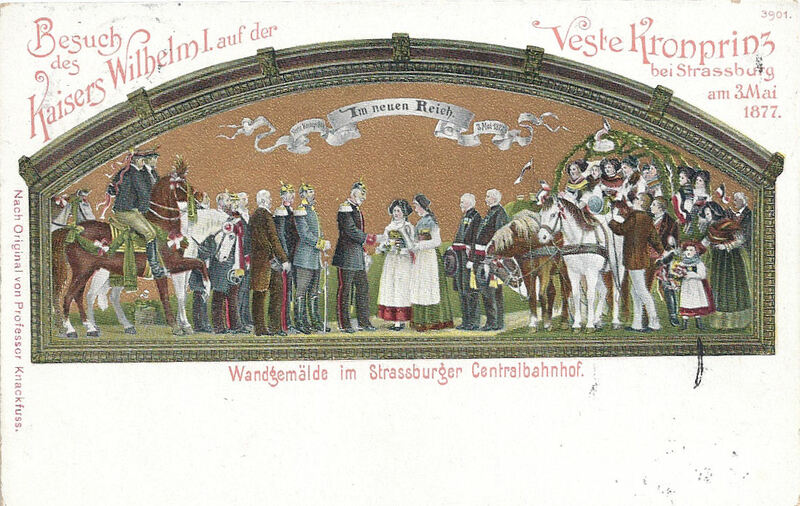 People come to the Vosges to walk, ski, drive, cycle; to examine flora and fauna; to investigate rocks and minerals; to eat well or stay in peace; to buy produce to take home; to enjoy the hot brightness and the mountain air after the humidity of the Rhine plain in summer, or to have fun in the deep snows. 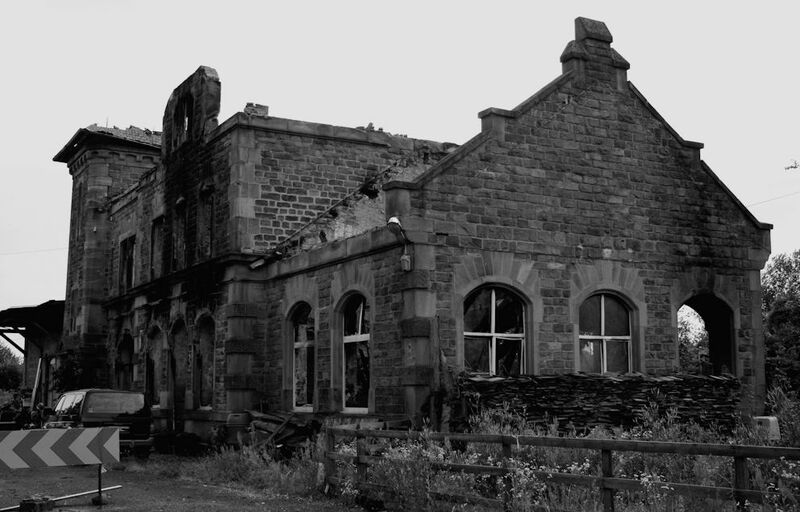 It was equally a source of pleasure, exploration and challenge before the Great War. 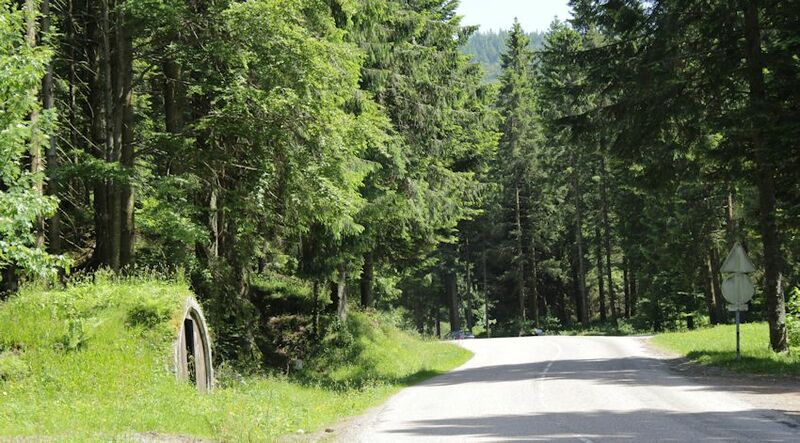 Access through the Vosges is historically through a series of cols. 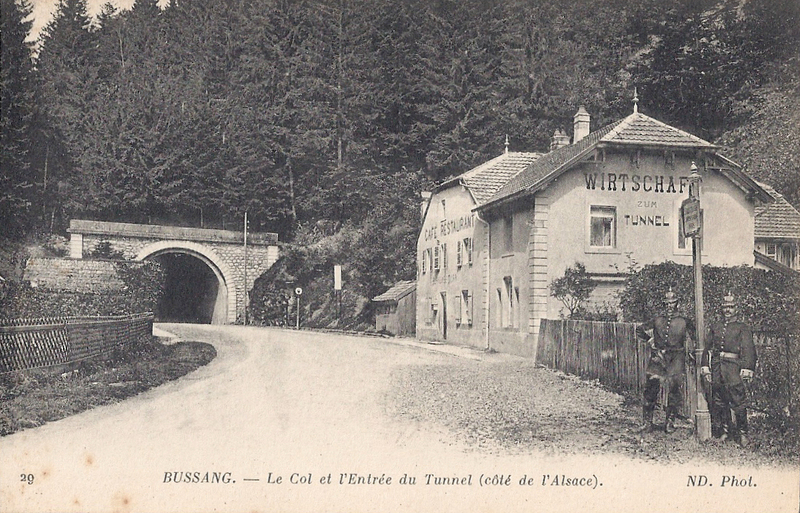 When Alsace and Moselle became the newly-named Reichsland Elsaß Lothringen, the cols ceased to be the passages from one department to another: they became the legal crossing from one state to another. 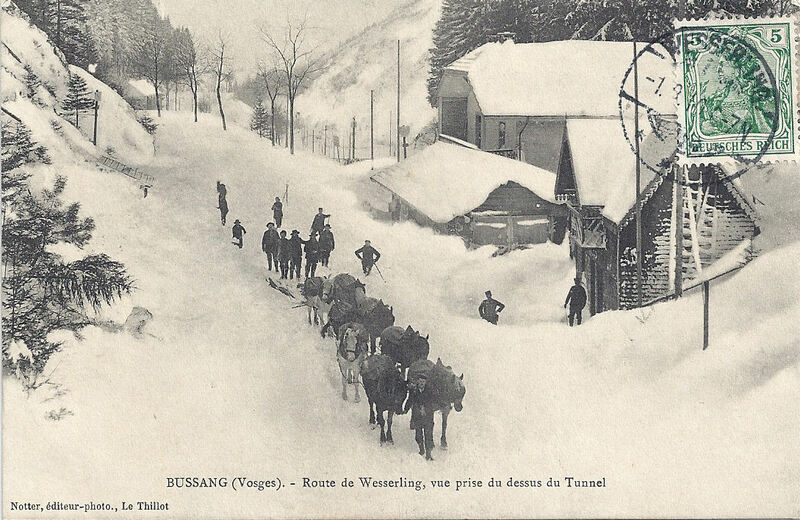 Travellers and tourists still visited the Vosges and they crossed the frontier with a mixture of bewilderment, curiosity, anger, despair, sadness and astonishment, evidenced by the thousands of postcards on sale and their poignant hand-written messages. 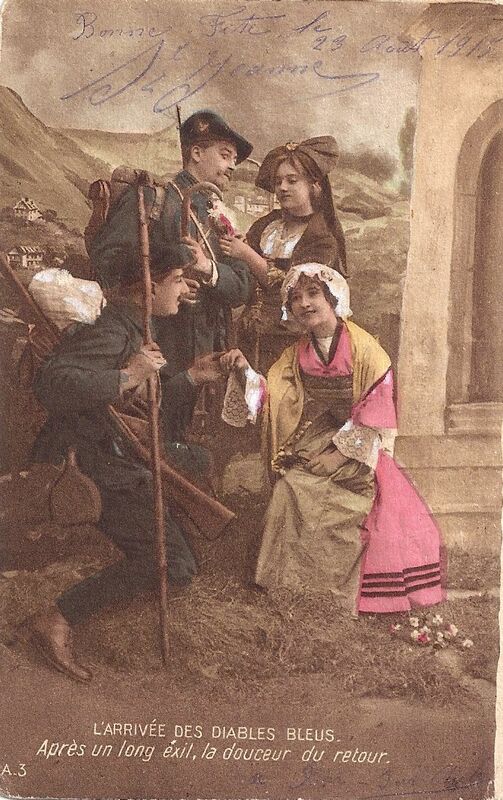 Patriotic cards showing the return of Alsace and Lorraine to France were popular before and during the Great War, then sent by soldiers who perhaps didn’t wish to depict the awful scenes they witnessed, or perhaps written by senders who wished to encourage and motivate. 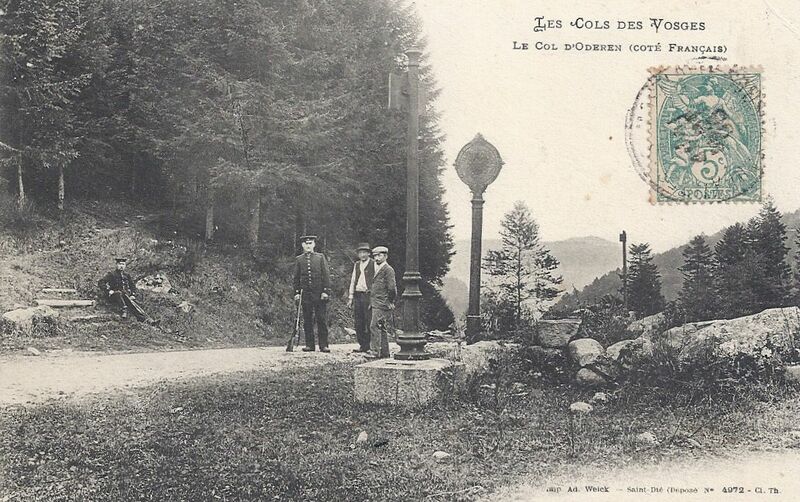 Some of the minor cols were heavily fought over because of their strategic importance: Col de la Chipotte (south west of Raon l’Étape) is less famous than the well-known sites such as le Linge and le Vieil-Armand / Hartmannswillerkopf but the human suffering and loss on both sides there in August-September 1914 was appalling. The map shows the main cols in the Vosges, approximately marked. 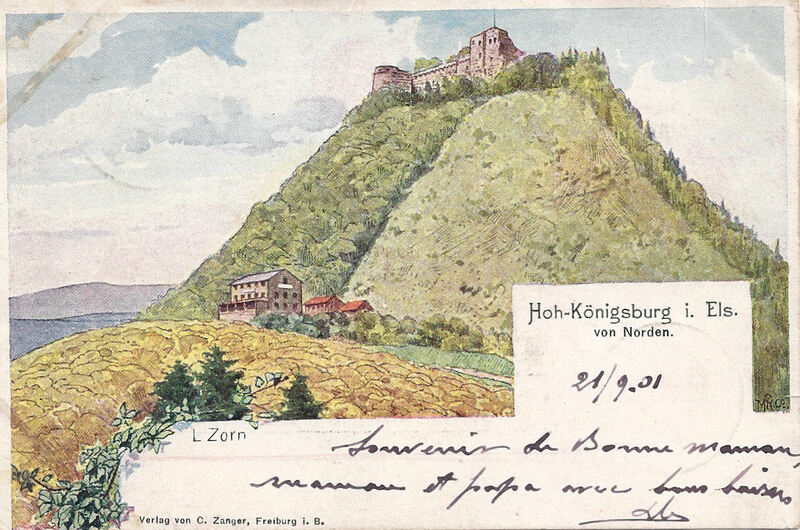 I’ve also included the summits of the Ballon d’Alsace and Hohneck. 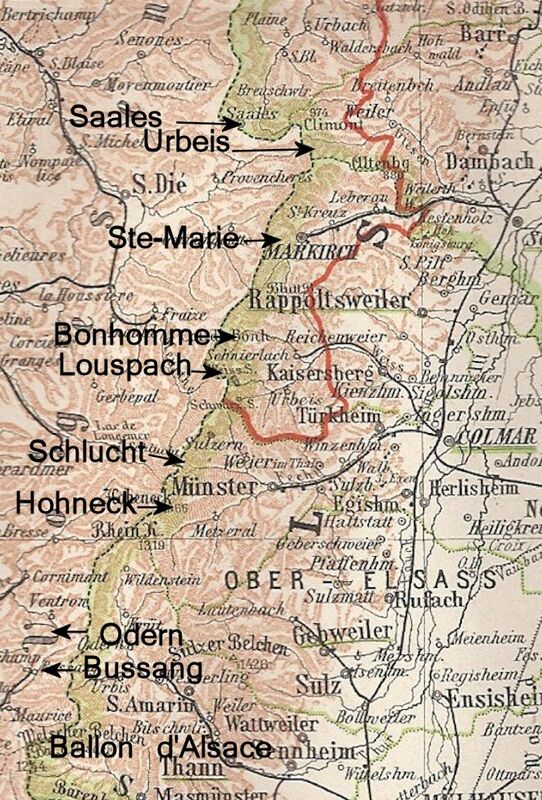 North of the map area were the cols of Donon (west of Molsheim) and Hantz (west of Barr). I will feature each of the cols in forthcoming individual pieces. They are all worthy of special attention! 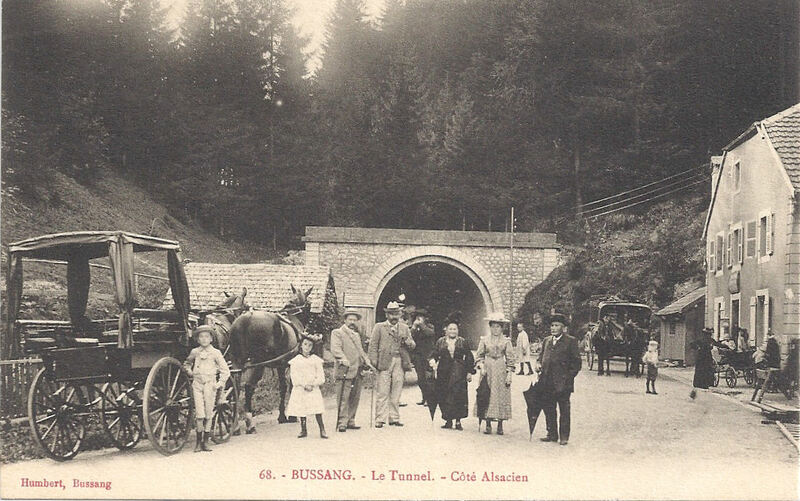 Categories: A little history - the background and the early frontier, The Vosges Cols | Tags: Alsace, cols, Elsass Lothringen, frontière, frontier, Reichsland Elsaß Lothringen, Vosges | Permalink.